The lymphocyte activation gene-3 (LAG-3) molecule is a T cell activation Ag closely related to CD4 at the gene and protein levels. We investigated whether LAG-3 itself may down-regulate the immune response by interfering with TCR signaling. The binding of Ab to the LAG-3 molecule followed by cross-linking (XL) inhibits cell proliferation and cytokine secretion in response to CD3XL on activated T cells. LAG-3XL-induced down-regulation is associated with functional unresponsiveness, as well as with high CD25 expression levels and reversion by exogenous IL-2. It is also associated with a down-modulation of CD3/TCR complex expression. At the biochemical level, LAG-3XL inhibits calcium response to CD3 stimulation. This inhibition is observed with different LAG-3- and CD3-specific mAbs on condition that the two receptors are cross-linked together. Finally, the capping of CD3 was shown to induce cocapping of LAG-3 molecules. Together, these results show that CD3/TCR complex-associated LAG-3 molecules can play an active role in negatively regulating the CD3/TCR activation pathway. They ultimately suggest that LAG-3 is an inhibitory receptor in activated T lymphocytes. The CD4 coreceptor interacts with nonpolymorphic regions of MHC class II molecules on APC and contributes to T cell activation through increased cell adhesion and signal transduction. CD4 signaling results in the activation of a number of early events, similar to the ones induced by TCR stimulation, such as calcium mobilization, tyrosine phosphorylation, and enhanced T cell proliferation in response to the TCR. CD4 triggering is unable to induce IL-2 activation alone, and its effect at the level of late events can be traced only in the presence of the TCR complex-derived signals. In addition, CD4 also has a negative regulatory role in T cell activation in some instances. CD4 cross-linking (CD4XL)2 abrogates both Ag-induced and anti-TCR-induced T cell activation (1, 2, 3). In vivo experiments have shown that MHC class II molecules, physiologic ligands of CD4 molecules, were able to inhibit memory CD4+ T cells (4). Lymphocyte activation gene-3 (LAG-3) is closely related to CD4 at the gene and protein levels. LAG-3 and CD4genes map in the same locus only 6 kb apart (5), may share some common regulatory elements (6), and probably result from a gene duplication (7, 8). Both CD4 and LAG-3 belong to a distinct subgroup of structurally related IgSF proteins with four extracellular Ig-like domains and a W × C signature motif in domains 2 and 4 (7, 9). LAG-3 is transcribed in activated CD4+ and CD8+ T cells as well as in activated NK cells. Like CD4, LAG-3 binds to a nonpolymorphic region of MHC class II molecules (10), and it may have a higher avidity compared with CD4 as evidenced by stable interaction of soluble LAG-3Ig but not CD4Ig fusion proteins with MHC class II+ cells (11). Finally, the finding of three dominant negative mutations in LAG-3 IgSF domain 1, able to inhibit the binding of wild-type LAG-3 molecules in a cell-cell adhesion assay, suggests that LAG-3 like CD4 (12) may oligomerize at the cell surface to interact more efficiently with MHC class II molecules (9). The physiologic role of encoded LAG-3 protein is still unclear. Ag-specific stimulation of T cell clones in the presence of anti-LAG-3 mAb leads to increased thymidine incorporation and enhanced cytokine production, suggesting that the mAb disrupts a negative signal induced by LAG-3/MHC class II interactions (13). A negative regulatory role of LAG-3 in CD4+ T-lymphocyte activation has also been suggested by experiments in which T cell-expressed MHC class II molecules were cross-linked by LAG-3Ig fusion proteins leading to inhibitory signaling (10). These observations do not exclude a putative role in signal transduction for LAG-3, which, in contrast to CD4, does not code for a C × C p56lck binding motif in the intracytoplasmic region but does code for a Glu-Pro (EP) repeated motif at its C terminus (9). These findings induced us to investigate the effects of LAG-3 cross-linking (LAG-3XL) on cell proliferation, cytokine secretion, and CD3/TCR complex modulation. We report that LAG-3 is associated with the CD3/TCR complex and may play a negative regulatory role in T cell activation. This inhibitory signaling through LAG-3 leads to functional unresponsiveness and results in the inhibition of TCR-induced calcium fluxes. These data underline the importance of CD3/TCR complex-associated HLA class II ligands in normal immune homeostasis. PBMC were isolated from heparinized venous blood of healthy volunteer donors by Ficoll-Paque (Pharmacia Fine Chemicals, Piscataway, NJ) density gradient centrifugation method. Cells were frozen in Origen-DMSO and thawed at 37°C before culture. T lymphocytes from PBMC were stimulated with 1 μg/ml of PHA-P (Wellcome, Beckenham, U.K.) or by incubating 5 × 105 PBMC/ml with mouse fibroblasts (1.25 × 105 cells/ml) transfected with human CD32 plus CD80 (provided by C. E. Demeure, Centre Hospitalier Universitaire de Montréal, Canada) in culture medium (RPMI 1640 supplemented with 10% heat-inactivated human AB serum, glutamine, sodium pyruvate, penicillin, and streptomycin). Fibroblasts were previously irradiated with 10 Gy and incubated with 10 ng/ml of OKT3 (anti-CD3 mAb, mouse IgG2a) for 30 min at 37°C. mAb used in cross-linking experiments were previously titrated for optimal reactivity in an immunofluorescence staining assay. 17B4 (LAG-3.1-specific IgG1) and OKT4 (CD4-specific IgG2b) were used as ascitic fluids at a saturating dilution of 1/800 and 1/150, respectively. CD19 (Immunotech, Marseille, France) and OKT4 (Ortho Diagnostic Systems, Raritan, NJ) were also used. For cross-linking, goat anti-mouse (GAM) Ig were purchased from Biosource Europe (Rungis, France). After 7 or 9 days of culture, 3 × 106 cells/ml were left in medium alone or treated with 17B4, OKT4, or CD19 for 30 min at 4°C. Cells were then washed in RPMI 1640. Three different methods were used to cross-link LAG-3. For some experiments, cells were incubated with GAM-coated immunomagnetic beads (Dynal, Oslo, Norway) for 30 min at 4°C with continuous gentle mixing. Tubes containing the cells were then applied to magnetic particle concentrator (Dynal) for 2 min followed by removal of supernatant. Bead-attached cells were washed twice and plated at a final concentration of 106 cells/ml in 24-well flat-bottom plates. After 3 days of culture, cells were removed from the beads and functional analyses performed. For other experiments, cells were incubated with GAM (3 × 106 cells/ml) for 30 min at 4°C before being cultured at 106 cells/ml for 24 h in 24-well flat-bottom plates, or the cells were directly cultured for 24 h in 24-well flat-bottom plates previously coated overnight at 4°C with GAM (10 μg/ml) in borate buffer (pH 8.4, 0.1 M). For immunostaining experiments, the mAb used were: 17B4 (LAG-3.1 epitope) labeled with FITC in the laboratory, Leu3a (CD4-PE); Leu2a (CD8-PE), Leu4 (CD3-FITC), WT31 (TCR α/β-FITC), γ1/γ1 (mouse IgG1 control, FITC-PE), and streptavidin (SA-FITC) obtained from Becton Dickinson Immunocytometry Systems (San Jose, CA); MsIgG1 (mouse Ig), CD28-FITC, and IL-2R1 (CD25-FITC) from Coulter Immunology (Hialeah, FL); and annexin V-FITC, CD95 (CD95-FITC), and Fas ligand (CD95L-biotin) purchased from PharMingen (San Diego, CA). Direct immunofluorescence was performed 3, 6, or 24 h after cross-linking. Cells (2 × 105) were incubated with mAb for 30 min at 4°C in RPMI 1640, then washed twice with 1× PBS. The mean fluorescence of 3 × 103 viable cells was measured by flow cytometry with an Elite cytometer (Coulter Immunology). At 1 or 24 h after cross-linking, T cells (105 cells/ml) were stimulated in 96-well round-bottom plates in the presence of 10 Gy irradiated human CD32+CD80+ fibroblasts (0.125 × 105 cells/ml) plus OKT3 (100 ng/ml). rIL-2 (Cetus, Emeryville, CA) was added in some experiments. The cultures were pulsed with 1 μCi/well of [3H]thymidine for the final 16 h. [3H]Thymidine incorporation was determined by the liquid scintillation counting method. Results are expressed as the mean cpm of three replicates. Cells were stimulated 1 day after cross-linking as described before (see proliferation assay). The supernatant of each well was collected at 6, 24, or 48 h and frozen at −80°C. Experiments were performed in duplicate. Commercially available ELISA kits (Immunotech, Marseille, France) were used according to the manufacturer’s instructions. IL-2, IFN-γ, and TNF-α kits were purchased from Immunotech. PHA blasts (4 × 106) were loaded with 3 μM of fura-2/AM (Calbiochem, Meudon, France) in 300 μl of a 50-mM HEPES buffer, pH 7.2, supplemented with NaCl (150 mM), CaCl2 (1 mM), MgCl2 (0.5 mM), KCl (5 mM), Na2HPO4 (1 mM), and glucose (1 mg/ml) for 20 min at 37°C. Cells were diluted with 5 ml of the same buffer and reincubated for 20 min at 37°C. After centrifugation, cells were resuspended in 1.5 ml of the buffer before [Ca2+]i was measured. The continually agitated cell suspension was excited alternatively at 340 and 380 nm, and the fluorescence was measured at 510 nm. Either 17B4 (10 μg/ml), OKT4 (10 μg/ml), 13B8-2 (10 μg/ml), or CD19 (10 μg/ml) used as an isotypic control mAb was added 140 s before or at the time of the addition of OKT3 (0.01, 0.1, and 1 μg/ml) plus GAM (20 μg/ml). UCHT-1 (1 μg/ml) was also used as a CD3-stimulating mAb. The fluorescence was monitored with a Perkin-Elmer LS-5B luminescence spectrometer (Perkin-Elmer, Bois d’Arcy, France) in cuvettes maintained at 37°C. Graphic representations of [Ca2+] were computed by using the equation [Ca2+] = 225 × (R − Rmin)/(Rmax − R) × Sf380/Sb380, as previously described (14). Purified LAG-3-specific mAbs 17B4, 1E4, and 1D11 (provided by Ares Advanced Technology, Randolph, MA) were also used. Anti-IgG1 and anti-IgG2a GAM were obtained from Southern Biotechnology (Birmingham, AL). Statistical differences in the TCR-induced calcium fluxes following LAG-3XL or CD4XL were determined using a Wilcoxon matched pairs test. The statistical Spearman rank order correlations test was used to determine the correlation between inhibition of CD3/TCR expression following LAG-3XL vs CD4XL. All procedures were performed at 0°C to 4°C unless stated otherwise. T lymphocytes were incubated in RPMI, 5% FCS at 5 × 106 cells/ml with CD3ε-specific mAb (OKT3, 1 μg/ml) for 20 min, washed in buffer, and incubated with FITC-labeled anti-IgG2a GAM (20 μg/ml, Southern Biotechnology) for an additional 20 min. Cells were washed and were either fixed immediately in 1 ml PBS, 4% formaldehyde for 10 min at 4°C to analyze uncapped cells, or were incubated in RPMI, 5% FCS at 37°C for 5 min to induce capping of CD3 molecules. In both cases, cells were washed with ice cold PBS containing 0.1% NaN3 and incubated for 20 min in the same buffer with either LAG-3 (17B4)-, LFA-1 (C4C8D9, IgG1)-, or CD4-specific (IgG1, Immunotech) mAb, then washed and incubated for 20 min with 20 μg/ml Texas Red-labeled anti-IgG1 GAM. Cells were then fixed in 1 ml PBS, 4% formaldehyde and plated on polyl-lysine-coated glass microslides (Menzel-Glaser, Saarbrucken, Germany) and mounted using Immu-Mount (Shandon, Pittsburgh, PA) as an anti-fading solution. To generate optical sections of fluorescently labeled cells, an imaging system consisting of a Provis AX70 microscope (Olympus) equipped for a 100× oil immersion objective lens carrying a piezoelectric z-axis focus device, a CCD camera (Photometrics Sensys, Tucson, AZ) and a set of computer controlled excitation filters, was used. The light haze inherent to fluorescent signals was deblurred mathematically using Exhaustive Photon Reassignment software (Scanalytics, Billerica, MA) (15). To judge potential cocapping, only cells that displayed a clear CD3 cap structure and expression of LAG-3 were analyzed. In an effort to study the effect of LAG-3/MHC class II interactions on recently activated PBMC, we isolated LAG-3+-activated T cells by positive selection on GAM-coated Dynabeads using the LAG-3-specific 17B4 mAb. We observed on these T cell lines that the LAG-3+ enriched fraction was unable, for several days, to proliferate or to secrete IFN-γ and TNF-α after a subsequent TCR stimulation (data not shown). Such T cell hyporesponsiveness led us to investigate the effect of LAG-3XL on T cell activation and proliferation. We first studied the effect of three different LAG-3-specific mAb, 17B4, 11E3, and 15A9 (8), on activation Ag expression and cytokine secretion. No effect was found on PHA blasts when LAG-3-specific mAb were used either alone or cross-linked with soluble GAM (data not shown). We concluded that a LAG-3-specific mAb in solution alone or cross-linked with GAM was not potent enough to induce functionally relevant LAG-3XL signaling. In the following experiments, PBMC were stimulated with OKT3 incubated with mouse fibroblasts transfected with human CD32 and human CD80. A low concentration of OKT3 was enough to obtain a strong proliferation due to the costimulatory signal provided by CD80 (B7.1). For instance, 10 ng/ml of OKT3 led to 3 × 104 cpm [3H]thymidine incorporation for 105 PBMC at day 5 of the kinetics. At day 7, cells were incubated with anti-LAG-3 or -CD4 mAb, and extensive cross-linking was performed by incubating cells on GAM-coated plates. Following overnight LAG-3XL or CD4XL, cells were analyzed for their capacity to proliferate or to secrete cytokines in response to a second TCR-stimulation performed at 1 h (not shown) or 24 h (Fig. 1⇓) following cross-linking. Day 7-activated PBMC (a mixture of CD4+- and CD8+-activated T cells, not shown) weakly expressed LAG-3 (Fig. 1⇓A). LAG-3XL dramatically inhibited IFN-γ (Fig. 1⇓B) and TNF-α (Fig. 1⇓C) synthesis. IL-2 production assessed in the presence of CD25-blocking mAb was also reduced (not shown). The effect on Th2-induced cytokines could not be tested, as no IL-4 or IL-10 was detected in our culture conditions using commercially available ELISAs. Finally, LAG-3XL also inhibited T cell proliferation induced by CD3 stimulation 24 h (but not 1 h; not shown) following cross-linking (Fig. 1⇓D). A similar down-regulation was observed after CD4XL. No change was ever observed with CD19-, CD1a (OKT6)-, or CD71 (OKT9)-specific mAbs used as negative controls, compared with the GAM alone condition (data not shown). We observed such inhibition of TCR-induced proliferation in 15 experiments using PBMC from five different healthy individuals and cross-linking with GAM-coated Dynabeads (not shown) or GAM-coated plates performed 7 (Table I⇓) or 9 (not shown) days after the first stimulation. LAG-3XL- and CD4XL-induced down-regulation of T cells. PBMC were cultured for 7 days on CD32+CD80+ fibroblasts plus OKT3 as described in Materials and Methods. At day 7, cross-linking was performed by incubating cells with saturating doses of 17B4 (LAG-3) or OKT4 (CD4) plus immobilized GAM, with immobilized GAM alone (GAM) or medium alone (Med). A, LAG-3 expression on activated T cells at day 7. B, IFN-γ and C, TNF-α production as measured using ELISA 24 h after reengagement of the TCR with OKT3 (100 ng/ml) plus CD32+ CD80+ fibroblasts, 1 day after cross-linking. Shown are the mean of two replicates. D, [3H]Thymidine incorporation was measured 2, 3, and 4 days after reengagement of the TCR (see B). Shown are the means of three replicates. In our experiments, LAG-3XL or CD4XL did not induce necrosis nor apoptosis because there was no change in terms of propidium iodide incorporation or annexin V, Fas, or Fas ligand expression at either 6, 24, or 72 h after cross-linking (data not shown). We thus analyzed whether the observed down-modulating effects could be related to a desensitization process. We first tested whether LAG-3XL could have induced down-regulation of CD28 expression, leading to T cell unresponsiveness to a subsequent TCR reengagement in the presence of CD80+ fibroblasts (Fig. 2⇓). No CD28 modulation was observed after LAG-3XL nor after CD4XL (Fig. 2⇓A). In addition, despite their observed hyporesponsiveness, LAG-3XL or CD4XL cells expressed high levels of CD25 molecules 1 day after cross-linking, as compared with the condition in which CD19, an isotype-matched control mAb, was used (Fig. 2⇓B). Finally, we tested whether the addition of IL-2 could reverse LAG-3XL-induced down-regulation. LAG-3XL- but also CD4XL-induced inhibition of T cell proliferation was reversed in a dose-dependent fashion by IL-2 above a threshold of 10 IU/ml (Fig. 2⇓C). Altogether, these data indicate that LAG-3XL induces functional unresponsivness with high CD25 expression levels and reversion by exogenous IL-2. LAG-3XL- and CD4XL-induced high CD25 expression levels and reversion of down-regulation by exogenous IL-2. One day after cross-linking, cells were assessed for CD28 (A) and CD25 expression (B) by immunofluorescence. CD19 is an isotype-matched control. C, Percentages of LAG-3XL- and CD4XL-induced inhibition of proliferation were calculated by comparison with the GAM condition. Increasing doses of rIL-2 (0, 1, 10, and 100 IU/ml) were added to culture at the time of reengagement of the TCR. Since cross-linking of LAG-3 inhibited TCR-induced proliferation and cytokine secretion in our assay systems as efficiently as cross-linking of CD4, a CD3/TCR complex-associated molecule, we analyzed the effects of such cross-linkings on CD3/TCR complex surface expression. Figure 3⇓ shows that both LAG-3XL and CD4XL led to down-modulation of CD3 and TCR molecules. This effect was absent at 3 h, appeared at 6 h (not shown), and peaked 24 h after cross-linking (Fig. 3⇓A and Table I⇑). 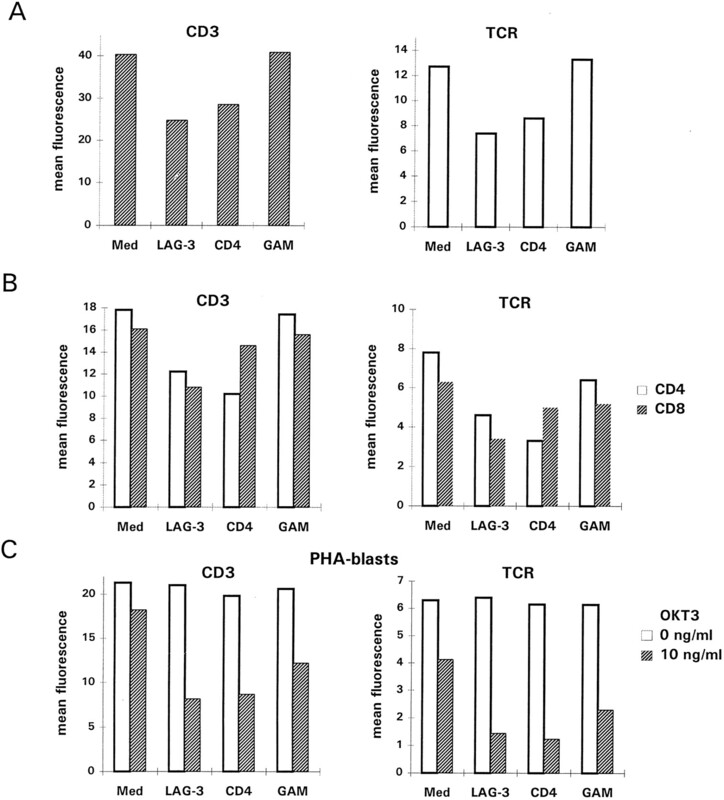 LAG-3XL induced CD3 and TCR down-modulation on both CD4+ and CD8+ T cells (Fig. 3⇓B). Strikingly, in these experiments in which the down-modulating effect was variable from one blood donor to another (Table I⇑), the effect of LAG-3XL was correlated with that of CD4XL (p = 0.001 and r = 0.77 for CD3; p = 0.004 and r = 0.7 for TCR; see Table I⇑). LAG-3XL- and CD4XL-induced down-modulation of CD3/TCR complex. CD3 and TCR epitope expression was assessed by immunofluorescence 24 h after cross-linking on T cells (A) or on CD4+ or CD8+ subpopulations by two-color immunofluorescence (B). Similar analysis was performed with PHA blasts after cross-linking with or without the addition of OKT3 (10 ng/ml) (C). Since a low concentration of OKT3 was used at the start of the culture period, we could not exclude the possibility that some anti-CD3 mAb remained on cells after 7 days in culture, so that CD3/TCR complexes were cross-linked together with LAG-3 or CD4, thus leading to the observed effect. When using PHA blasts instead of anti-CD3-stimulated T cells, CD3/TCR expression was not altered by LAG-3XL or CD4XL (Fig. 3⇑C). Nonetheless, the addition of small amounts of OKT3 (10 ng/ml) at the time of cross-linking, together with 17B4 or OKT4, led to weaker CD3 or TCR expression compared with the addition of OKT3 alone (Fig. 3⇑C). Altogether, these results suggest that LAG-3 might be physically associated with the CD3/TCR complex on both CD4+ and CD8+ T cells. LAG-3XL effect on CD3-induced elevation of [Ca2+]i was then studied using day 6 PHA blasts. A LAG-3-specific mAb, added 140 s before CD3 plus GAM stimulation, inhibited [Ca2+]i elevation (Fig. 4⇓). No inhibition was found without GAM cross-linking (not shown). This effect was observed for an optimal (1 μg/ml OKT3), intermediate (0.1 μg/ml OKT3), or in some experiments for a suboptimal (0.01 μg/ml OKT3) CD3 stimulation (Fig. 4⇓A). A similar effect was observed when LAG-3 and CD3-specific mAbs were added all together (data not shown). When compared with CD19, an isotype-matched control mAb, the LAG-3XL inhibitory effect was found in a series of six experiments for 1 μg/ml (p = 0.008) and 0.1 μg/ml OKT3 (p = 0.028), but not for the suboptimal dose (p = 0.079) (Fig. 4⇓B). In the absence of CD3 signaling, LAG-3XL did not modify [Ca2+]i (not shown). These results suggest that LAG-3-mediated inhibitory signaling may directly interfere with early events induced by CD3/TCR signaling. LAG-3XL inhibited CD3-induced elevation of [Ca2+]i. A, CD3-induced elevation of calcium was performed using day 6 PHA blasts and increasing doses of OKT3 (0.01, 0.1, and 1 μg/ml) plus GAM (20 μg/ml). For LAG-3 signaling, 17B4 (10 μg/ml) was added 140 s before CD3 stimulation. As an isotype-matched control, CD19 mAb was added in a similar manner. B, Schematic representation of six or eight experiments performed as described in A. Lines connect values representing the variation of [Ca2+]i induced by the CD3-induced stimulation. Probabilities were calculated using a Wilcoxon paired rank test. LAG-3XL and CD4XL effects on CD3-induced [Ca2+]i elevation were compared in the presence of two different CD3 mAbs, OKT3 and UCHT-1 (Fig. 5⇓). 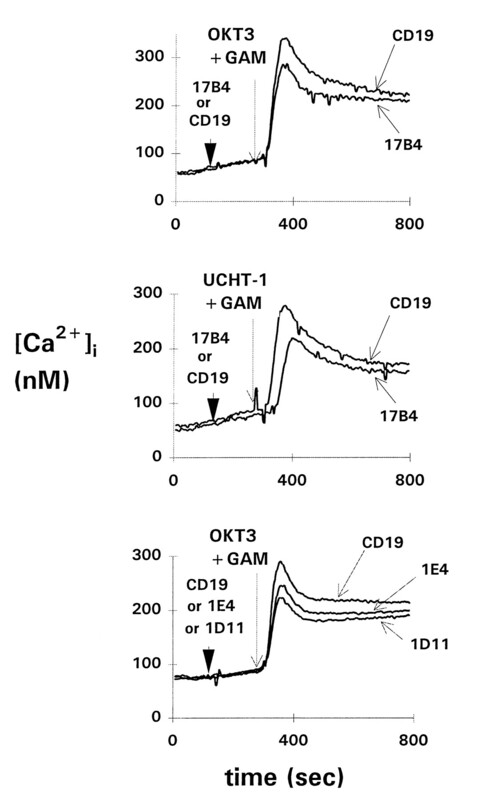 LAG-3XL inhibitory effect was similar using UCHT-1- or OKT3-induced stimulation, whereas no significant modulation of [Ca2+]i elevation was observed in these two conditions after CD4XL (data not shown). In addition, two other LAG-3-specific mAbs (1E4 and 1D11) recognizing distinct epitopes of the D1 IgSF-like LAG-3 extracellular domain were found to inhibit, like 17B4, the CD3-induced elevation of [Ca2+]i (Fig. 5⇓). Effect of LAG-3XL on CD3-induced elevation of [Ca2+]i using different CD3- or LAG-3-specific mAb. CD3-induced elevation of calcium was performed using OKT3 or UCHT-1 (1 μg/ml) plus GAM (20 μg/ml). For LAG-3 signaling, 17B4, 1E4, 1D11, or CD19 (control mAb) (10 μg/ml) was added 140 s before CD3 stimulation. Experiments were also performed in a Ca2+-free medium in the presence of EGTA. As shown in Figure 6⇓, TCR-induced Ca2+ mobilization, resulting from the release of Ca2+ from intracellular stores, was not modified by LAG-3XL. Only the rapid Ca2+ influx observed after addition of external calcium was inhibited by LAG-3XL (Fig. 6⇓). LAG-3XL inhibited CD3-induced elevation of [Ca2+] influx. 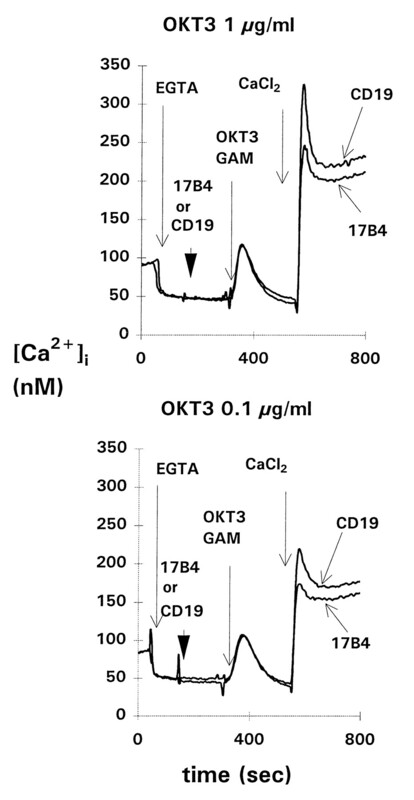 CD3-induced elevation of calcium was performed as described in Figure 4⇑ with the addition of EGTA (3 mM) at 40 s to chelate extracellular calcium. 17B4 or CD19 were added 140 s before OKT3 at 270 s and GAM at 300 s. [Ca2+] influx from the outside was permitted by the addition of CaCl2 (5 mM) at 600 s.
To determine whether LAG-3 had to be coaggregated with CD3/TCR to play its inhibitory role, we took advantage of the differences in isotypes of LAG-3 and CD3-specific reagents (17B4: IgG1, UCHT1: IgG1, OKT3: IgG2a) and used anti-IgG1 and anti-IgG2a GAM fractions for cross-linking. These IgG1 or IgG2a fractions were obtained by positive selection on a IgG1 or IgG2a affinity column followed by adsorption on an excess of the other isotypes. This procedure counterselects cross-reactive Ab that may recognize common C region epitopes and coaggregate LAG-3 with the CD3/TCR complex. Figure 7⇓ shows that inhibition of TCR-induced [Ca2+]i elevation was not observed when LAG-3 and CD3 (with OKT3) were cross-linked independently using the isotype-specific second Ab. On the contrary, the LAG-3XL inhibitory effect was observed when 17B4 and UCHT-1 (both IgG1) were cross-linked with an anti-IgG1 goat anti-mouse mAb. Figure 7⇓ also shows that the anti-IgG1 or IgG2a fraction fails to cross-link IgG2a (OKT3) or IgG1 (UCHT-1) mAb, respectively (Fig. 7⇓). These findings show that the coengagement of LAG-3 with CD3 is necessary to down-modulate the signal. Effect of independent cross-linking of LAG-3 and CD3. Day 6 PHA blasts were analyzed for [Ca2+]i mobilization after stimulation with OKT3 (IgG2a, 1 μg/ml) plus anti-IgG2a GAM Ig (10 μg/ml) with or without the concomitant addition of 17B4 (IgG1, 10 μg/ml) plus anti-IgG1 GAM (10 μg/ml). In the same experiment, CD3-induced elevation of calcium was performed by UCHT-1 (IgG1, 1 μg/ml) plus anti-IgG1 GAM (10 μg/ml) with the concomitant addition of 17B4 (1 μg/ml) or CD19 (IgG1, 1 μg/ml). 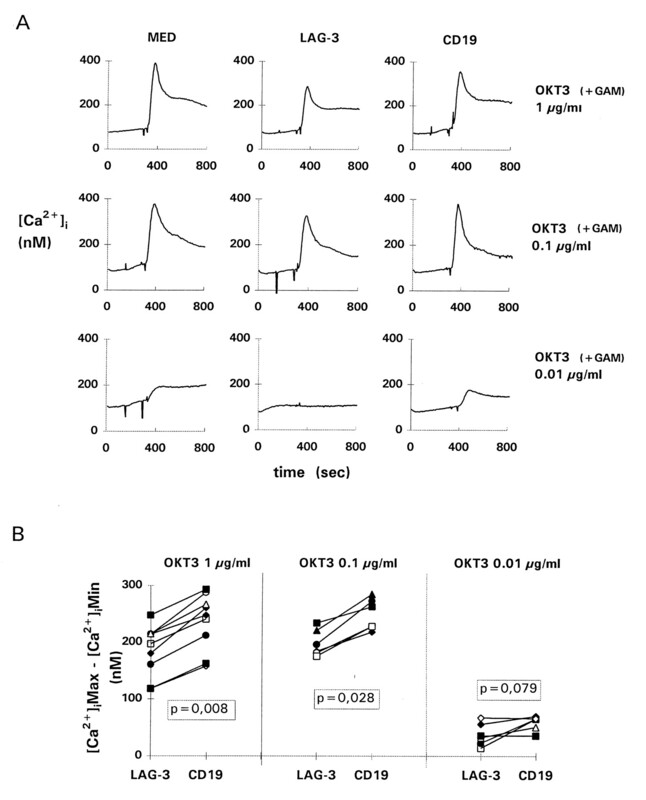 As a control of GAM specificity, elevation of [Ca2+]i was induced by OKT3 (1 μg/ml) alone or plus anti-IgG1 GAM (10 μg/ml) and UCHT-1 (1 μg/ml) alone or plus anti-IgG2a GAM (10 μg/ml). To study a possible lateral association of LAG-3 and CD3, CD3ε molecules were collected into caps by cross-linking with specific mAb; and the capped cells were examined by double indirect immunofluorescence to determine whether LAG-3 was cocollected with the CD3 caps. After warming the labeled cells 5 min at 37°C, the CD3 Ag was generally collected into a cap (Fig. 8⇓A). 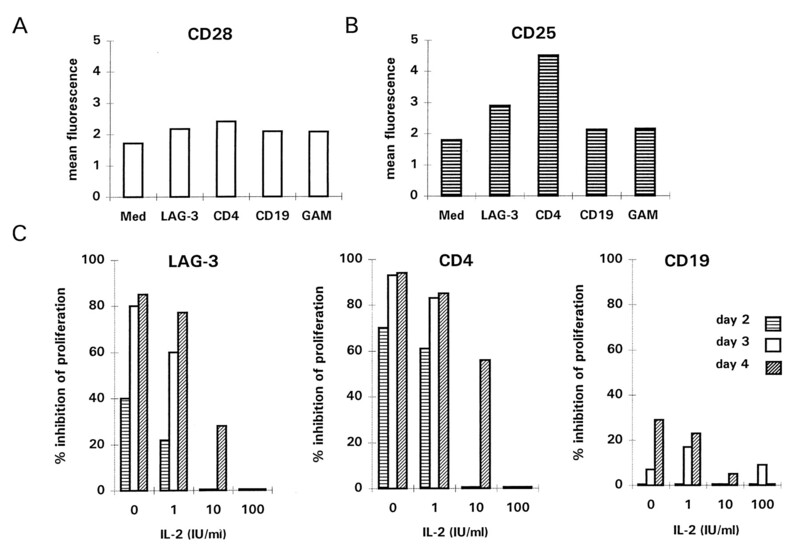 A uniform staining was observed for LAG-3 in CD3 uncapped cells (not shown), whereas CD3-capped cells displayed a significant codistribution of LAG-3 with the CD3 caps (Fig. 8⇓A). This was observed in 80% of cells displaying CD3 caps (75 cells analyzed in three experiments). By contrast, no cocapping was found with LFA-1 used as negative control (Fig. 8⇓B). Thus, LAG-3 and CD3 are specifically associated (directly or indirectly) in activated human T cells. In contrast, CD3-capped cells did not displayed CD4 cocaps (Fig. 8⇓C), an observation in line with previous experiments with murine T cells (16). LAG-3 cocapping on CD3 capped cells. A, CD3ε molecules were capped on PHA blasts at 37°C by preincubating the cells with OKT3 (IgG2a) plus FITC-labeled anti-IgG2a GAM. Caps of LAG-3 were observed on CD3ε-capped cells following the addition of 17B4 (IgG1) plus Texas Red anti-IgG1 GAM. LFA-1 (B) and CD4 (C) expression on CD3ε-capped cells were also analyzed. Images 1 and 2 show two examples of cells. The aim of the present study was to examine whether LAG-3 might signal into activated T cells. We focused on experimental systems in which CD4XL plays a negative regulatory role on T cell activation, resulting in decreased T cell proliferation and cytokine synthesis. We show here that LAG-3XL on preactivated T cells results in diminished cell proliferation and lymphokine production following TCR reengagement. We also show that LAG-3 interacts physically with the TCR/CD3 complex on activated cells because 1) LAG-3XL induces CD3/TCR down-modulation, 2) inhibition of [Ca2+]i is observed only following coengagement of LAG-3 with CD3, and 3) caps of CD3 induced cocapping of LAG-3. TCR signaling requires a finely regulated balance between a positive signal that initiates the response and a negative signal that controls the threshold, extent, and termination of TCR activation. Negative regulatory receptors include CD5, a CD3/TCR complex-associated molecule (17), the killer inhibitory receptors (KIRs) (18), and CTLA-4 (19). The data presented herein support the idea that HLA class II molecules may be important in maintaining homeostasis of the immune system by negatively regulating T cell activation. The refractory state thus induced in activated T cells through LAG-3 signaling would prevent undue T cell activation in the absence of a proper TCR triggering. Down-regulation of T cell activity via LAG-3 could occur in both CD4 and CD8 T cell subsets. LAG-3 signaling affects proximal TCR signaling events, leading to a decreased calcium response. Overall, the present results suggest a possible role for LAG-3 in the induction and/or maintenance of tolerance. Quenching of T cell activation when TCR, CD5, CTLA-4, and possibly LAG-3 are engaged represents a mechanism that down-regulates T cell responses (rather than terminating T cell responses through induction of apoptotic cell death), thereby endowing the immune system with the ability to generate memory responses. LAG-3 expression is activation-dependent, whereas CD4 is constitutively expressed, and there are obviously many differences in the molecular pathways induced by the engagement of these two CD3/TCR complex-associated MHC class II ligands: 1) the MHC class II binding sites on LAG-3 vs CD4 are clearly distinct (9); 2) co-cross-linking of CD3 and CD4 induces p56lck phosphorylation events and modifies TCR stimulation positively, while LAG-3 does not have any p56lck binding motif in its intracytoplasmic region; 3) CD3 cross-linking on activated T cells with LAG-3XL but not CD4XL (even when anti-CD4 mAbs is added 20 min before cross-linking) inhibits [Ca2+]i; and 4) LAG-3 but not CD4 molecules seem to be closely associated with CD3ε molecules on the surface of activated lymphocytes, as assessed by cocapping experiments. In addition, it should be stressed that we used high affinity anti-CD3 mAb that engage all TCR at once at a 1:1 ratio and not low affinity ligands such as agonistic peptides known to be engaged in serial TCR triggering (20). In the latter situation, the relative contribution of LAG-3 and CD4 as transduction molecules delivering negative signals remains to be assessed. Various inhibitory receptors in hemopoietic cells can negatively regulate early tyrosine phosphorylations and [Ca2+]i increase induced in Ag receptor signaling by cytoplasmic kinases, such as the ZAP-70/Syk protein tyrosine kinases, when cross-linked with the activated Ag receptors. The tyrosine phosphatase SHP-1 (SH2-domain-containing protein tyrosine phosphatase-1) and/or the 5′-inositol phosphatase SHIP (SH2-domain-containing inositol polyphosphate S-phosphatase) are involved, after their recruitment on the consensus sequence called ITIM (immunoreceptor tyrosine-based inhibitory motifs) present in the cytoplasmic domain of these receptors (21, 22). However, no such sequences are present in the cytoplasmic domain of LAG-3. Additionally, we did not find, in preliminary experiments, an inhibitory effect of LAG-3XL on the tyrosine phosphorylations triggered by CD3 mAb. Therefore, the mechanism by which LAG-3XL inhibits Ca2+ signaling may be very different, although we cannot exclude a participatory role for a LAG-3-associated protein with ITIM motifs in the mediation of these inhibitory effects. Actually, LAG-3 is associated with a gp45 protein(s) on the surface of activated T and NK cells. This protein does not seem to be required for LAG-3 expression on the surface of transfected COS cells (23), where oligomerization may occur through the formation of homodimers and not LAG-3/gp45 heterodimers. The nature of the LAG-3-associated transducing element(s) is presently unknown, but gp45 is a likely candidate. Other candidates include proteins binding to the unique EP repeated motif located at the LAG-3 C terminus, which is conserved in mouse and man (9). Our results suggest that LAG-3 signal transduction needs to be stabilized over time (1 h is not sufficient to down-regulate CD3-induced T cell proliferation), for instance through extended oligomerization (LAG-3/LAG-3 and/or LAG-3/CD3-TCR complex), because secondary Ab (i.e., GAM) had to be immobilized on a solid surface to induce functional effects of LAG-3XL. These results are therefore in line with the idea that LAG-3 oligomerization may occur, as shown with transfected COS-7 cells by rosette formation in a cell-cell adhesion assay (9). They also suggest that both LAG-3 clustering and interactions with the TCR/CD3 complex directly contribute to negative triggering of effector T cells. Oligomerization of LAG-3 molecules may induce structural changes in the binding site that enhance complementarity at the interface between LAG-3 and MHC class II, and these structural perturbations may increase stability of the interaction. Oligomerization may take place following a transient interaction with MHC class II molecules, as suggested for CD4 oligomerization (12). It is suggested that MHC class II-induced changes of LAG-3/TCR complex formation in both CD4 and CD8 T cell subsets may play a role in negatively regulating the CD3/TCR activation pathway. A preferred site for such an interaction to occur in vivo may be the encounter in inflammed tissues of activated LAG-3+ T cells and professional APCs (e.g., dendritic cells and macrophages) known to express high levels of MHC class II molecules. We thank Dr. C. E. Demeure and M. Dreano for critical reading of the manuscript, Dr. C. Hivroz for helpful discussion, and Dr. W. Weisser for providing the 1E4 and 1D11 LAG-3-specific mAb. ↵2 Abbreviations used in this paper: XL, cross-linking; [Ca2+]i, intracellular free calcium; LAG-3, lymphocyte activation gene-3; GAM, goat anti-mouse; PE, phycoerythrin; ITIM, immunoreceptor tyrosine-based inhibitory motif; EP, glutamic acid-proline; IgSF, immunoglobulin superfamily.